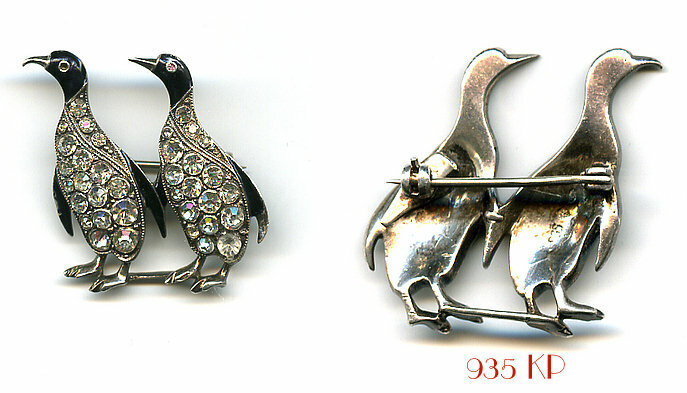 This tiny pin is of two charming penguins. Beautiful millegrain metal work. Bezel set paste bodies. One of the large stones is a replacement. Missing one tiny red eye. Black Enamel. Rhodium Plating. c.1930s Marked 935 KP. Another rare piece with the jewelers mark of EG on either side of a Star of David. I had it for a few years before I noticed it. This now resides (as it should) in the collection of Margrit Maguire and her son Thomas Wolfgang Maguire. The granddaughter and great-grandson of Theodor Knoll. Ironically, a couple of years after sending this to Thomas and his mom, I found another one of these but with a "C" clasp, marked only 935 KP, mine were also missing the ruby eyes (they are so tiny) This tells me that Knoll & Pregizer repeated styles over the years, as the one with the "C" clasp that I now own would have been earlier than the one in the photo. I have since seen multiples of several of their novelty type pins also made years apart.